At eBay, you may find anything. You never know what you may find on eBay. This is a picture which I bought in an eBay auction a few years ago. 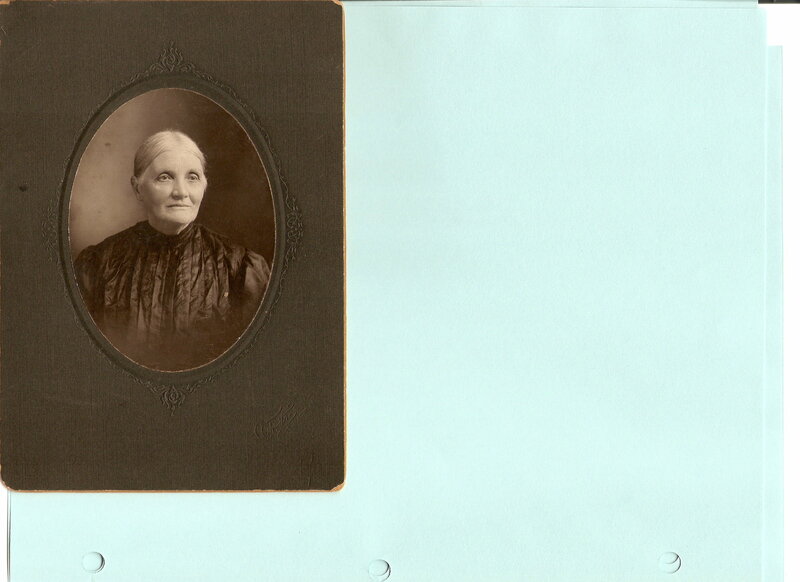 There is a caption on the back of the picture which reads, “This is my grandmother, Mrs. Joseph Schoenly. Her name was Emma. She was my mother’s mother”. Joseph & Emma Schoenly had two daughters, Eva D. Schoenly & Anna D. Schoenly. Evidently this picture at some point in time belonged one of their children. I just realized that Emma was a victim of the Boyertown fire of 1908. I got it now.So many Anna’s and Emma’s back then it has been hard for me to keep them straight. Esther Heacock is my great great grandmother. Her parents were Willis Heacock & Annie Dierolf Schoenly. Willis’ parent’s were Amos P. Heacock and Emeline P. Heacock. who also had a daughter Annie L.K. Heacock who married George Schoenly whose son is Norman Schoenly. George Schoenly and sister Annie Dierolf Schoenly’s parents were Joseph Schoenly and Emma Dierolf. George and Annie also had a sister Eva who married William Toms. Wow! This is a great interview, thanks. Ooops! I was wrong about Emma’s death. She was not a victim of the Boyertown Fire after-all. She lived until 1916.. I’m not sure how I got turned around with this. It is so easy to get things turned around. There are so many Annies and Emmas and maybe even Esthers that I have to put it all down and come back to it later and figure out who is who. I think Emma Dierolf would be my great great great great grandmother but I found a berks county marraige record that may show otherwise. I have some more work to do. Thank you for your blog which may provide others with info they seek or just bring to light some history once lost. Did Joseph and Emma have a son George? here is an interview with Norman Schoenly Jr.http://digital.lib.lehigh.edu/beyondsteel/pdf/schoenly_96_109.pdf whose father was George Schoenly. Norman says his mother (Annie) was killed in the opera house fire. Norman mentions his grandparents Joseph and Emma Schoenly and also his grandparents the Heacocks. According to my great grandmother’s records Anna Dierolf Schoenly married Willis Heacock who was a harness maker near Boyertown they had children on being Esther Heacock my great grandmother’s mother. According to my notes, Joseph H. Schoenly -and- Emma Dierolf had four children. They were: George D., Anna D., William D. & Eva D. Schoenly. So glad you enjoyed the Norman Schoenly interview. this info was on Joseph and Emmas children that you proved me is very helpful to my search. from your notes and the Norman Schoenly interview and my great grandmothers notes I have come up with this: George D. Schoenly married Annie Heacock a child Norman (Annies father is Amos Heacock and mother Emma Krauss). Anna (Annie) D. Schoenly married Willis Heacock child Esther Mae Heacock my great great grandmother. William D. Schoenlly married Esther K Heacock. Eva Married William z. Toms. As you can see there are more than one Esther & Annie and also there are three mothers named Emma. And it seems George’s sister Annie married George’s wife Annie’s brother Willis to complicate things. Annie D. S. Heacock is my great grandmothers grandmother that is how I have the picture. It seems the Schoenly and Heacock siblings married each others brothers or sisters. Annie D. Schoenley married W. Heacock. Annie Heacock married George Schoenely. Annie Heacock Schoenly (not Dierolf Schoenly) was lost in the opera house fire according to the interview with her son Norman Schoenly. Joseph Schoenly and wife Emma had a daughter Annie Dierolf who married George Schoenly whose parent were also Joseph and Emma but Schoenly not Dierolf. Many people married a Joseph or an Emma then like Amos and Emeline P. Heacock (might as well be Emma) married. confusing. I’ll have to write this out on paper to figure it out. Anyway, it is very nice to see a picture of one of them. Thank you. I still have it wrong. I think. haha.